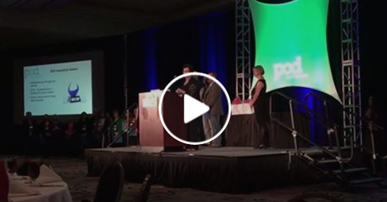 Video: 2016 POD Innovation Award Winner Watch Michael Palmer from UVA’s Center for Teaching Excellence and Adarsh Char from FTA win the 2016 POD Innovation Award. Norcross, GA, February 2, 2017 – The University of Virginia (UVA) and Full Tilt Ahead, LLC (FTA) were awarded the 2016 POD Innovation Award given by the POD Network (http://podnetwork.org/) at their 41st Annual Conference held in Louisville, Kentucky at the Galt House Hotel. The award was given for work on c3Design, a highly-interactive, online learning environment that creates deeper understanding by guiding instructors through the process of backward-integrated course design. One POD Innovation Award has been presented each year since 1986 to participants who implemented creative ideas for the enhancement of teaching and learning and/or faculty development. The winner is chosen by a committee of POD Network members representing various programs and institutions using the criteria of (a) originality, (b) scope and results, (c) transferability, and (d) effectiveness. c3Design is a fully online learning environment based on UVA’s center for Teaching Excellence’s internationally-recognized Course Design Institute, a face-to-face course design program based on the process of putting the learner first. The experience strives to help instructors unlock new perspectives and possibilities. Several innovative features support this goal: a series of well-crafted knowledge checks, an auto-populated syllabus template, a groundbreaking integration map, an award-winning syllabus rubric, and a fully searchable syllabus database. As institutions of higher education continue to value, promote, and reward evidence-based practices of teaching and learning, c3Design has the potential to scale the ability to help instructors develop pedagogically sound, evidence-based courses that promote deep learning for all students. It is intended as a resource and community for scholars and practitioners who want to advance teaching and learning through professional development. FTA is a small, woman-owned Education Technology company with significant experience in online learning and software development. This experience has allowed them to evaluate and identify the best-in-class solutions and approaches to online course design and development. FTA has put together a team with strengths in visual, instructional, and application design that excels in developing unique and creative academic technology tools. Beyond FTA’s core expertise in online learning for higher education, they have developed an award winning literacy tool called Read Ahead, and they are very active in the Atlanta K-12 education technology community.